Most of us know about the importance of iron and calcium for our bodies, but what about magnesium? It is the second most abundant element in human cells and the fourth most important positively charged ion in the body. It helps the body regulate over 325 enzymes and plays an important role in organizing many bodily functions, like muscle control, electrical impulses, energy production and the elimination of harmful toxins. 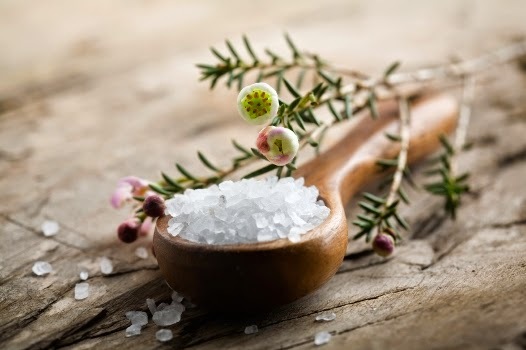 Most of us are deficient in magnesium, so I’m going to put on my wise-granny hat on here and tell you this: soaking in a bath with Epsom salt, which is high in magnesium, is one of the easiest ways to get a boost. According to the National Academy of Sciences, American’s magnesium deficiency helps to account for high rates of heart disease, stroke, osteoporosis, arthritis and joint pain, digestive maladies, stress-related illnesses, chronic fatigue and a number of other ailments. Who knew?! Our magnesium levels have dropped by half in the last century due to changes in agriculture and diet. Industrial farming has depleted magnesium from soil and the typical American diet contains much less magnesium than that of our forefathers. And in fact, the modern American diet with its fat, sugar, salt and protein actually works to speed up the depletion of magnesium from our bodies. Another factor in decreased magnesium levels has been our focus on getting enough calcium. It’s a delicate dance–calcium depletes magnesium yet calcium functions best when enough magnesium is present. Studies indicate that taking a calcium supplement without enough magnesium can increase the shortage of both nutrients. Researchers have found that many Americans have five times as much calcium as magnesium in their bodies, although the proper ratio for optimum absorption of both minerals is two to one. With such widespread magnesium deficiency one might think that magnesium supplements would be called upon, but studies show that magnesium is not easily absorbed through the digestive tract. The presence of specific foods or drugs, certain medical conditions, and the chemistry of a person’s stomach acid can render magnesium supplements ineffective. This brings us to Epsom salt. Known scientifically as hydrated magnesium sulfate, Epsom salt is rich in both magnesium and sulfate. While both magnesium and sulfate can be poorly absorbed through the stomach, studies show increased magnesium levels from soaking in a bath enriched with Epsom salt! Magnesium and sulfate are both easily absorbed through the skin. Sulfates play an important role in the formation of brain tissue, joint proteins and the proteins that line the walls of the digestive tract. They stimulate the pancreas to generate digestive enzymes and are thought to help detoxify the body of medicines and environmental contaminants. Improved heart and circulatory health, reducing irregular heartbeats, preventing hardening of the arteries, reducing blood clots and lowering blood pressure. Improved ability for the body to use insulin, reducing the incidence or severity of diabetes. Flushed toxins and heavy metals from the cells, easing muscle pain and helping the body to eliminate harmful substances. Improved nerve function by electrolyte regulation. Also, calcium is the main conductor for electrical current in the body, and magnesium is necessary to maintain proper calcium levels in the blood. Relieved stress. Excess adrenaline and stress are believed to drain magnesium, a natural stress reliever, from the body. Magnesium is necessary for the body to bind adequate amounts of serotonin, a mood-elevating chemical within the brain that creates a feeling of well being and relaxation. Reduced inflammation to relieve pain and muscle cramps. Improved formation of joint proteins, brain tissue and mucin proteins. Prevention or easing of migraine headaches. All this from a bath? Hurray! While there are many different brands of Epsom salt, they are all the same product chemically, and can be found at most drug stores. Add two cups of Epsom salt and soak for at least 12 minutes. Do this three times weekly. U can subscribe to Rise Earth for many goodhealth tips. To purchase Ancient Minerals – Professional Strength – Magnesium Oil 64oz. To purchase Ancient Minerals – Professional Strength – Magnesium Gel Plus 8oz. Previous post: Comedy & Laughs 4 Goodhealth. Next post: Antibiotics in Cupboards. Afternoon4 Biscuits & Milky tea? High Doses of Vitamin D3& Why? Mighty Fatigue Reductions 4 my family. Hearing Loss & Brain Rot? Serranol – Inflammation & pain. Comedy & Laughs 4 Goodhealth.